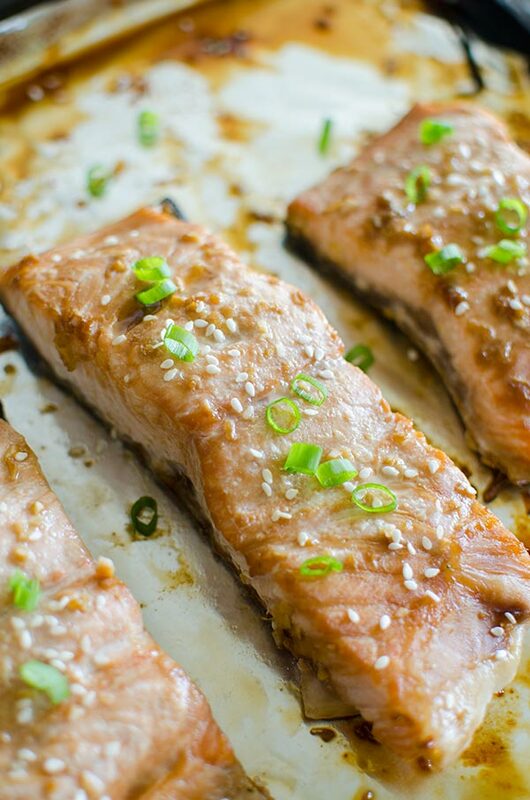 Get dinner together quickly with this simple recipe for roasted teriyaki glazed salmon with a homemade teriyaki sauce made with soy sauce, ginger and garlic. I really try to limit eating out or takeout during the week, which means I need quite a few quick dinner recipes up my sleeve. I usually walk in the door absolutely starving, so time is of the essence. I feel like this is a struggle for most of us. This salmon recipe was inspired by a story I wrote for Metro News back in December. 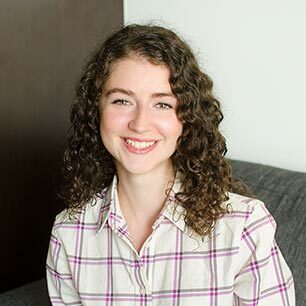 It was a piece on quick and healthy weeknight dinners and I wanted to create something that was A) accessible, B) family-friendly and C) easy. The teriyaki flavour checks all of those boxes and inspired me to create this recipe for you. The ingredients are all staples of basically all groceries stores, the inherently sweet nature of teriyaki lends itself well to family meals and this recipe is so easy–it’s made with six ingredients and takes less than 40 minutes. The perfect amount of time to whip up a quick quinoa salad or grilled asparagus (or both!). This recipe requires a quick 20-minute marinade which is when I would prep and cook whatever side dishes I would serve with this salmon. How long should you marinate fish for? Usually when it comes to marinating, we expect the answer to be a long time. That’s true when it comes to tougher proteins, especially pork and beef, but fish is a delicate protein. You should marinate fish for 15 minutes to one hour (max). Since fish is much more delicate than meat or poultry, it doesn’t require a long marinating time. Often times, the acidity in a marinade will actually “cook” the fish (this is how ceviche is made) and this will start to break down the fish too much. You should also marinate the fish skin side up to allow the fish to take on more of the marinade flavour. I also wouldn’t marinate frozen fish while it’s still frozen as this could cause food safety issues. Always start with your ingredients when they are fresh or have thawed completely. For this recipe, 20 minutes is just enough time to impart the salmon with teriyaki flavour without beginning to cook the fish. In this recipe, the acidity comes from rice vinegar, but you can also use lime or lemon juice. In a glass dish, whisk soy sauce with honey, rice vinegar, ginger and garlic. Add salmon, skin side up, to the marinade. Cover and refrigerate for 20 minutes. Preheat oven to 425F. Line a sheet pan with foil. Add salmon; pour remaining marinade over salmon. Roast for 13-15 minutes or until fish is fully cooked. 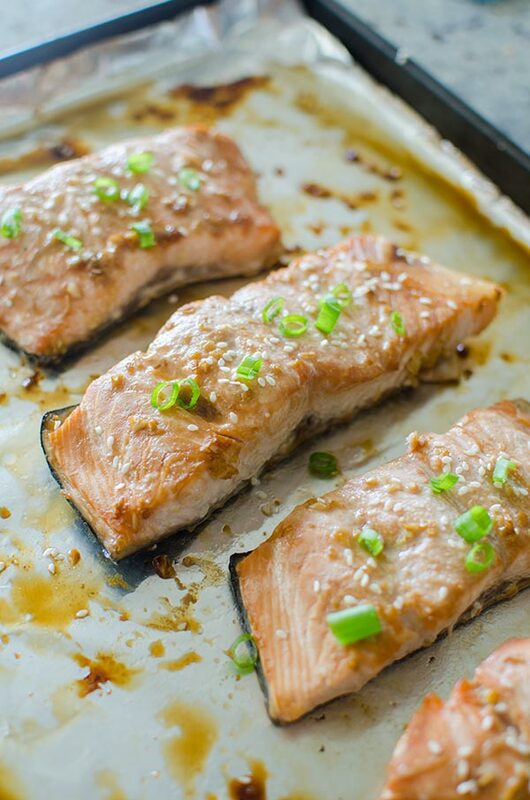 Let me know if you give this roasted teriyaki salmon recipe a try in the comments below. Thanks Bianca, let me know how it goes! I have always felt deficient when it comes to fish. This recipe sounds like a great way to branch out from my "safety zones." Thank you! Thanks Angela, let me know how it goes! I've made this recipe twice now and I absolutely LOVE it. I did make a few modifications but completely due to personal taste, and I'm not a big ginger fan so I only used 1/2 teaspoon and a HUGE garlic fan so I used two cloves instead of 1. Still absolutely delicious, and it very much impressed my friends haha. Thanks for the recipe! This is my favourite salmon dish! I add a ton of extra garlic (like 5 cloves hahaha) and often swap out the fresh ginger for powdered. Thanks for the recipe! Thanks Alina, I'm so glad that you enjoy this recipe! So good and so easy! Ended up using hot honey (Chili pepper infused kind of hot) since that was what I had on hand and it was still so great! Thanks Emma, I'm so glad you enjoyed this recipe!